If you follow my blog and social media wisdom, you’ve seen action pics of my pal Ziggy. 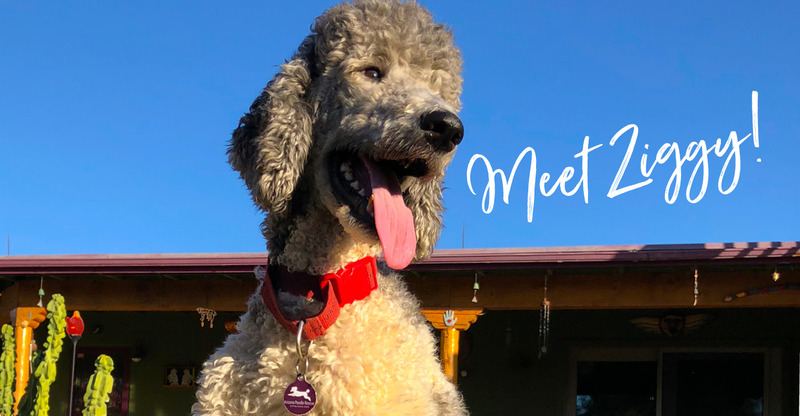 Ziggy is a rescue pup from Arizona Poodle Rescue who joined our household back in the spring. Like me, she’s a Parti Spoo. She’s a hottie. We’re both Standard Parti Poodles, which makes us Party Animals of the highest pedigree. We like trail walks, reggae, rock-n-roll, cumbias, chasing bunnies, going for a ride, barking for no apparent reason, and so on. Squirrel…quail! I love Ziggy. I’m glad she’s here. The first time we went to visit her right after my groomer sent my hoomanz a video of her running amok in a completely unchecked manner, totally out of control on a couch with her foster family. I was star-struck. As I strutted up the drive-way, she sprinted around the corner, took one look at me and ran in the opposite direction, jumped up on a chaise lounge and peed herself and the chair cushions. I was in love right then and there! At that very moment, I knew she was mine. Forever mine. Of all the personalized gifts I could’ve gotten, she’s the best. She’s my very own Ziggy Stardust. She’s a rescue pup who’s bounced around a little bit in her young 18-month life. We are her 5th home/family, her permanent home. She and I are bonded for life. Plus, we look good together. Damn good. I’m sooooooo glad that my hoomanz are such cool pet lovers. Especially for letting me take Ziggy home. She thinks they got me for her, but that’s another story. Ziggy can jump higher than most of my other 4 legged friends. I bet she’d be a good Olympic agility dog. My hoomanz did a pet painting of her jumping in mid-air. Check it out! Show her a treat like a Milk-Bone™ and she’s up in the air at eye-level with my pet hoomanz, and this seems to delight and make them laugh. They’re easily amused. Rescue pups seem to have that effect on people. She also likes to get on the couch, curl up, make a moaning sound and lay there like a queen. Queen of what, I have no idea. But, we’re poodles. We don’t need mundane reasons. We’re royalty by who we are. Another thing Ziggy likes to do is chase bunnies in the back yard and birds sitting in the yard. She sprints out after them at lightning speed and has caught one in mid-flight on a few occasions. My response is to play tug-of-war with the bird. Not always very practical. Plus, my hooman pets don’t seem to appreciate that activity. Ziggy and I have another game that we play. Our hoomanz call it shadow puppets. We wrestle and get up on hind legs and bite each other. Sorta like two Godzillas going at it. The best time to do this is in front of the TV, that way we’re nicely backlit by the screen and get really good action poses. It’s better than Netflix. We prefer action over words. Words are cool, but action’s better. She just got a brand new Pittsburgh Steelers collar. Hot. Sometimes I look at her and I see an uncanny resemblance to the pet art and mobiles I see on the patio and around the house. But this rescue pup is quite a bit more mobile. Yes, life is good and poodle love is cool. Together, Ziggy and I are large and in charge!